It may be starting to look like Lost In The ‘80s around here, but who can resist that misunderstood decade when so much of it keeps returning to the fore. This month’s return is extra horns-inducing as it’s UK baggy new wavers The Members, who have announced a reformation. Known as one-hit wonders in Australia for the 1982 dance punk hit 'Radio', they barely raised an eyebrow outside Britain. 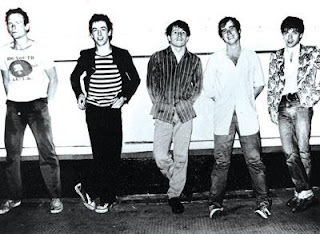 Originally working with the more vanilla producers Steve Lillywhite and Rupert Hine, the band hit their funky strides joining forces with Martin Rushent (producer for The Human League, The Stranglers, Buzzcocks, XTC, The Rezillos, Altered Images, etc), dad to Late Of The Pier’s James. The lads have reportedly played a few secret reunions since their split in 1983, but this time they will be undertaking a bona fide globe trot with their website reporting plans to hit Scandanavia, the US and Australia after shows in the UK. To commerorate the occasion they have revamped their old Offshore Banking Business cut as International Financial Crisis - reimagined with the aid of long-term collaborator, and Cure producer David M Allen.